Last winter 20 unsheltered Native people died of exposure in Gallup, N.M. This winter is shaping up to be especially cold and wet, making more vulnerable our many still unsheltered relatives. These deaths were preventable. The Red Nation is working with the Immediate Action Group, a coalition of faith groups and concerned community members, and Radmilla Cody’s “For the People” initiative for long-term solutions and quality care. We demand no exposure deaths this winter, as part of our No Dead Natives initiative. We demand proper services and equality of care. This winter, the people will not stand by while the city turns its back on Native people. The Red Nation calls the community to action! If the city won’t act, we will! 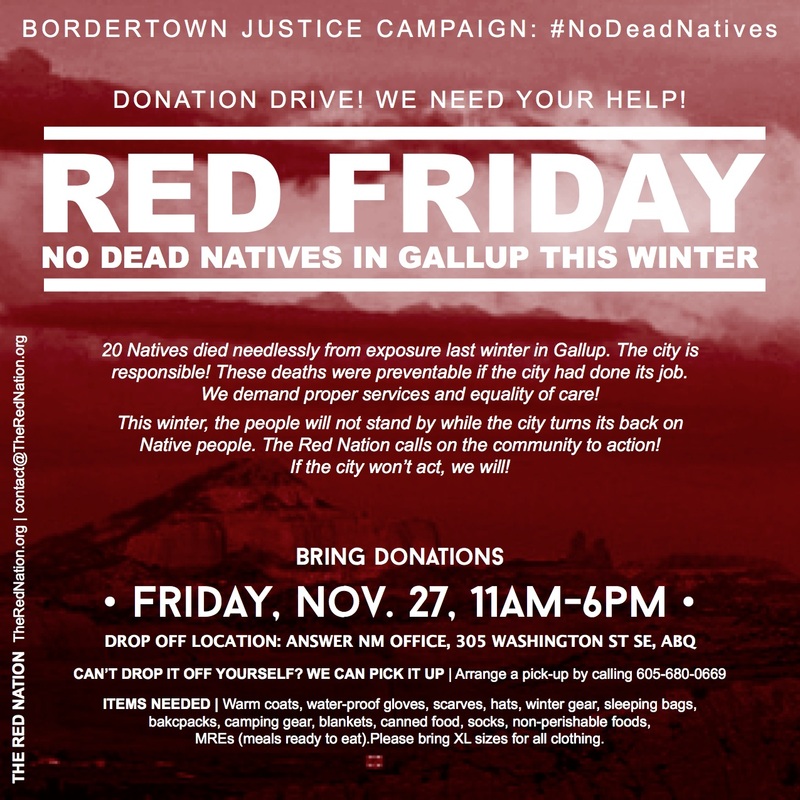 With upcoming “Black Friday” shopping for this holiday season, The Red Nation calls on all people to show support for our unsheltered relatives in Gallup by participating in donation drive we are calling “Red Friday” as part of our sustained border town justice campaign. The Red Nation volunteers will be at the ANSWER office at Suite C, 305 Washington St. SE, Albuquerque from 11 am – 6 pm to collect material and monetary donations. For those unable to make it, we can arrange an onsite pickup within the city. We ask those with the ability to give or volunteer to do so for those in need. We thank the many who have already set up collection sites in Albuquerque, Phoenix, Socorro, and Durango. We understand the situation in Gallup is dire for unsheltered Natives and this is a short-term solution. This is a systemic issue that requires systemic change all groups are working towards. Items needed: warm coats, water-proof gloves, scarves, hats, winter gear, sleeping bags, backpacks, camping gear, blankets, canned food, non-perishable food, MREs (meals-ready-to-eat). Please bring XL sizes for all clothing. Want to volunteer for Red Friday? Previous Call to Action: #NoDeadNatives in Gallup, N.M.